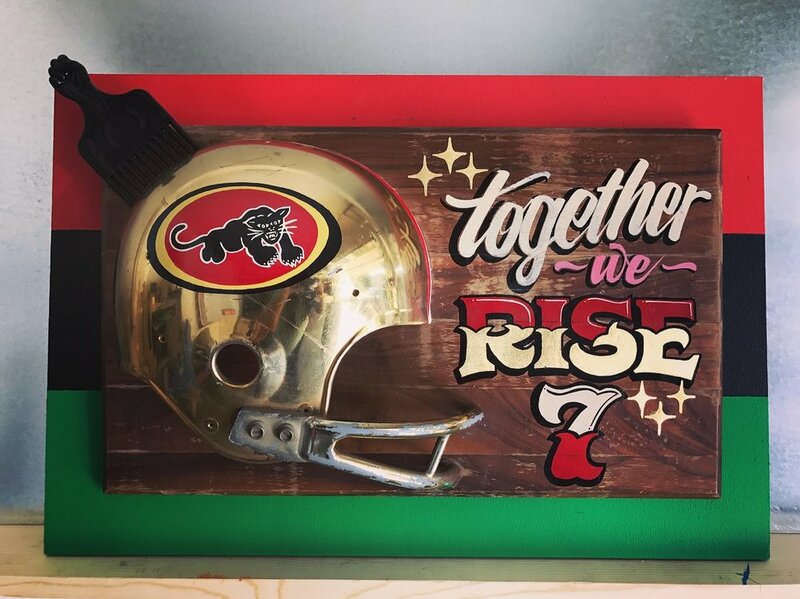 Like many hand-crafted arts, sign painting is experiencing a resurgence. Brooke Robinson, the founder of Goodtype, had the pleasure of meeting Nisha Kaur Sethi while she was in Austin, TX for SXSW. Nisha is a talented and dynamic Los Angeles based artist who tells us about her journey to becoming a sign painter—about how she developed her skills as a graphic designer behind a computer, which eventually began to weigh on her soul and opened up a part of her that longed to get back to the analog roots of design and work with her hands. 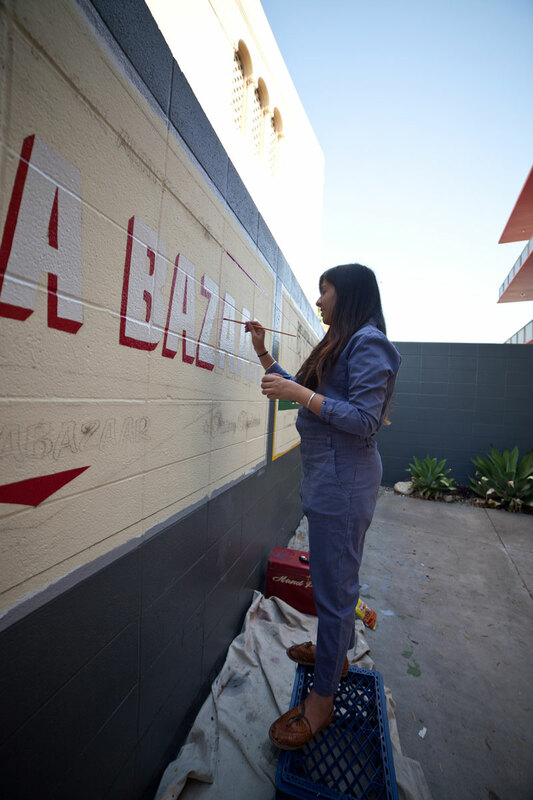 Goodtype: Tell us where you are from how you got into sign painting. Nisha Sethi: I was born and raised in Berkeley, California. My first introduction to art and lettering was through graffiti since I grew up in an urban landscape that was home to lots of street art. I started writing and tagging at age 17 and fell in love with letters. I had no idea at the time that the streets were actually teaching me about typography until I got to college and began studying graphic design. Soon, I found myself deeply researching and dissecting letterforms digitally. I was really passionate about design and landed my dream job at a music label upon graduating. The next three or four years were spent behind a computer where I developed my skills as a graphic designer but kind of started to lose my soul in the process. There was something inside me that kept yearning to work with my hands again and travel backwards into the analog world. That’s when I discovered the Sign Graphics program at Los Angeles Trade Tech. I saved up a bunch of money and left everything to move to LA and study under Doc Guthrie. My life totally switched gears and now I was up at 7 am every morning with a brush and mahlstick, learning the ins and outs of Sign-Painting with 1Shot. GT: Can society benefit from the art of sign painting. Are there global/social issues sign painting has the power to assist in resolving? NS: Absolutely. I believe that as artists, we have a certain responsibility to our society to use our talent for the greater good. When you look at previous social movements, art has had a long history of being used as a tool for empowerment and change. For example, you’ve got to think about what a protest would look like without any posters or signs? It certainly wouldn’t have the same impact. I am working to use the art of lettering to make an important statement. When I was in high school, I started organizing with different social justice based youth groups and was given the role of the Mobilizer; to gather the people when it was time for a protest or march. It was here that I began to delve into the world of political art and researching artists such as Emory Douglas who was the illustrator for the Black Panther Party newspaper. His artwork continues to be a great seed of inspiration for me. Being that we live in a very political climate at the moment, I have been focusing more on creating hand-painted signs and collage work that speak to specific causes. These pieces are all a part of a series I am working on that is influenced by protest signage of the 1960s. Most recently, I just wrapped up a project with Amplifier where I worked with a group of youth to see what message they would like to communicate to the world. The youth today are feeling particularly passionate about gun reform so they came up with a slogan that says, “No More Silence, End Gun Violence!” I took this message and used it to paint a hand-painted sign in the style of an old show-card. The artwork will now be included in a larger campaign against gun violence and is available as a free download where folks can print posters at home and take it with them to the March for Our Lives taking place nationwide in an effort to end gun violence. Have you seen an increase in demand for hand painted signs and murals? If so, why or why not? Hand-painted signs are undoubtedly increasing in demand. There was a big chunk of time in between, when vinyl lettering first took off where there was a huge loss of interest in hand-lettering. But I’m so delighted to see that people are finally starting to respect and admire the practice of Sign Painting again. It feels like a lost art that’s being rediscovered. I feel very grateful to be given the opportunity to carry on the legacy of journeymen Sign Painters. There are people like Doc Guthrie & Carlos Aguilar who are really keeping the art form alive by passing it down to the youth. I have the utmost respect for them as mentors and as artists. What influences your style? Are there any other art forms you like to practice? Being that my parents are originally from India, I grew up traveling there many times. I believe this was the first source of inspiration for me as a Sign Painter. India has a huge culture of hand-painting signs and Bollywood movie posters. I remember walking through the streets there and being completely in awe of all of the visual stimulation. Every wall is covered with advertisements and signs and movie posters. The style of lettering in India is very unique in that it really utilizes all the bells and whistles. The art work has to compete with the already over-saturated environment in which it exists so the signs are very bright and loud and intricate. Fruit and Ice Cream stands were my favorite because they were usually eight color convex letters with several outlines and shadows of contrasting colors, and blends, and fluorescents. I would definitely say that the styles I saw in India have a huge influence on my work. I’d like to think that it makes my work unique and recognizable. It also gives me the opportunity to incorporate and represent my culture, and that is very empowering. Who are some of your favorite sign painters and artists? Well I think it’s important to surround yourself with people you look up to so I would say that my favorite artists, firstly, are the artists in my crew TRUST YOUR STRUGGLE. Specifically, Miguel BOUNCE Perez who makes calligraphy look easy and is good at anything he does. In the same breath I would also have to mention SPIE and DREAM who remain legends in the Bay Area graffiti scene. They are the first artists to ever teach me about letterform. In terms of Sign Painters, my favorites include Doc Guthrie, Nurse Signs from Jamaica, Elliot Tupac from Peru, and Painter Kafeel from India. But the list goes on and on!! 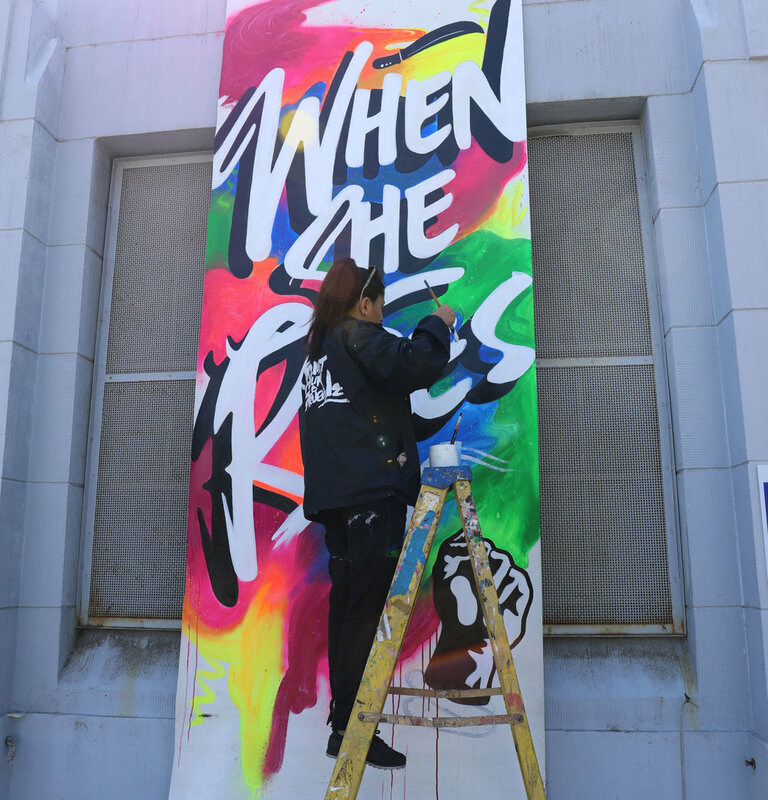 I would also like to take a moment and give major credit to all the female sign painters out there shining super bright. Being a woman sign-painter in such a male-dominated field is challenging but there are some pretty amazing folks such as Shelby Rodeffer and Meredith Kasabian who organized the “Pre-Vinylette Society: An International Showcase of Women Sign Painters” and continue to advocate for female empowerment within the Sign Painting community. Do you have any resources, suggestions or advice for anyone looking to learn the craft of sign painting? The LATTC Sign Graphics program is the last surviving program in the country that still teaches traditional hand-lettering techniques, so I would recommend checking that out. It’s a two year program and a huge commitment, but you will come out of there knowing how to letter. Besides that, there is a plethora of online tutorials and private classes you can take to learn the craft. I would suggest that you first study the history of hand-painted signs and know what you are getting into. Sign Painting is not just an art form, but a culture passed down from generation to generation so it is to be taken quite seriously. Amateurs will be picked apart. I think you have to truly be in love with lettering and have a passion for working early hours with pretty toxic materials. Overall, if you have enough passion and dedication, it’s a wonderful field to get into and express yourself. You can follow Nisha on Instagram @nisha.k.sethi. And learn more about her at nishaksethi.com. Photography by Joey Mintz and Odell Hussey Photography along with Mandeep Sethi.